Like most people, I’m constantly trying to master my sweet tooth; in tireless pursuit of healthy-yet-tasty dishes, here’s a fabulous breakfast offering, loaded with nourishing nutritional value and exquisite taste to satisfy the sugar craving! Granola from supermarket shelf tends to be full of simple sugars and transfats, but my home-made version is altogether more friendly! Quinoa, about which I’ve written previously, replaces oats in this batch, and a host of cinnamon-covered nuts-&-seeds make an appearance too, garnished with delicious berries! My personal view is that there’s no substitute for actual, genuine sugars, so I’ve lightly glazed the granola with Raw Manuka Honey (courtesy of Steens, with whom I’ve collaborated to whip up a number of delicious, healthy recipes). I’ve long believed Manuka to be a fabulous natural alternative to refined sugar, and has that beautifully rich floral aroma. The whole recipe is super easy to make, and is great for kids and adults alike! Click MORE to get the ‘why’ and ‘how to’, along with the health benefits of Manuka. 1) Boil the quinoa, drain it, and let it dry on kitchen towel. 2) Preheat oven to 350 degrees. Lightly coat the baking tray with coconut oil. 3) Mix all ingredients together. I used my Vitamix for 15 seconds on the lowest intensity. 4) Spread the mixture on a baking tray and toast for c. 5 minutes. 5) Allow to cool almost completely before manipulating, then popping it into your muesli container! This looks delicious! 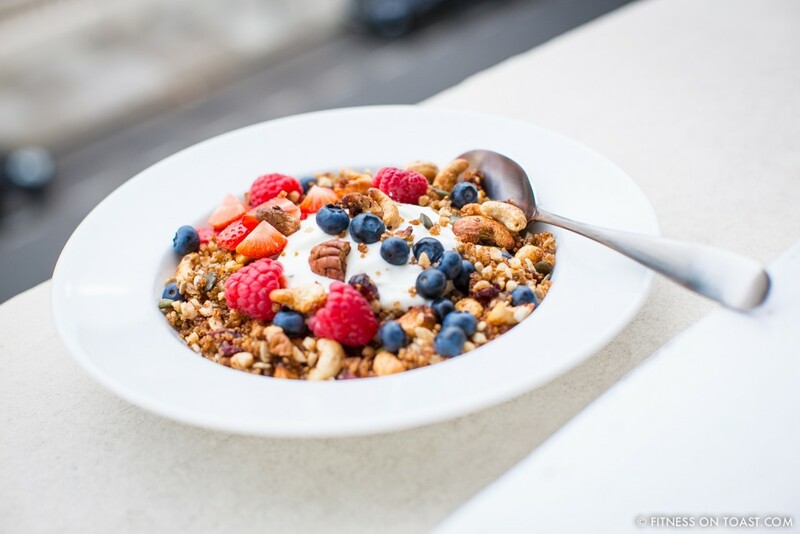 I’ve wanted to start making Granola for a while now, I will really need to try this out! That looks so tasty! It doesn’t look too hard either. Thanks for sharing the recipe! A pleasure! I would say that it requires zero cooking flare, just a love of a good breakfast! This looks great. Thank you for the knowledge about the manuka honey. It looks amazing! I love quinoa! It looks delicious. Does it burn fat? No. Sadly not Katrina, nor does it do the ironing 😭 but combined with plenty of exercise, it’s fine! Hi Faya! I’ve just stumbled upon your blog, congrats on being featured on Bloglovin’s 10 up and coming fitness blogger post! I can’t wait to take a stroll through more of your archives! This recipe looks incredible and I plan to try it! AMAZING! Can’t wait to try this! Thanks for sharing!